Armored The Art OF War announces release date and funding opportunity. Designed by Richard Langsmith, Armored – The Art of War is a simple card game rife with knowledge, incorporating Military doctrine and maneuvers into an entirely new breed of card game. Utilizing past, present and future Military weapons, equipment and men to wage war against their opponent to either total victory or humbling defeat, players will be required to learn and understand the tactical underpinnings of war as they take the place of the commander on the ground in this highly anticipated game of combat and skill. Based on accurate US Army doctrine, all aspects of the military decision making processes are encompassed; from combat troops to medics, logistics and even finance will add intricate layers to the game for advanced players and quick combat bonuses described in detail for beginners. Players will pit themselves against the tactical wizardry of their opponent as they attempt to annihilate enemy forces, turn after turn of maneuver, till at the last moment when they will have the advantage or be cannon fodder as their opponents troops roll over their decimated emplacements. Armored is designed for 2 players on a tabletop or map in the alpha release, and will accommodate larger teams in later rules modifications. Each player has a minimum of three rows and 5 columns that are active within the game. It is within these rows that assets are maneuvered onto the playing field. It is on this grid that players assert their will – advancing, retreating and evading their opponent, till someone is humbled. Players will have the freedom to change tactics on the fly; attacking or escaping depending on the situation. Armored – The Art of War is scheduled for an alpha release in Jan of 2014, the roll out will begin in Huntsville Alabama. Initial roll out will be to contributors who helped fund it on Kickstarter, web stores, Gaming conventions and hobby/comic shops. Decks for Navy, Marines and Air Force are planned as well as Russia and China. Founded in 2011, Langsmith Enterprises is an independent game development studio based in Woodville Alabama. The Studio was formed by Richard Langsmith CEO of MillieModels, an animation and Simulation Company. Langsmith Enterprises is the global leader in Autostereoscopic Haptic integration for simulation and gaming. 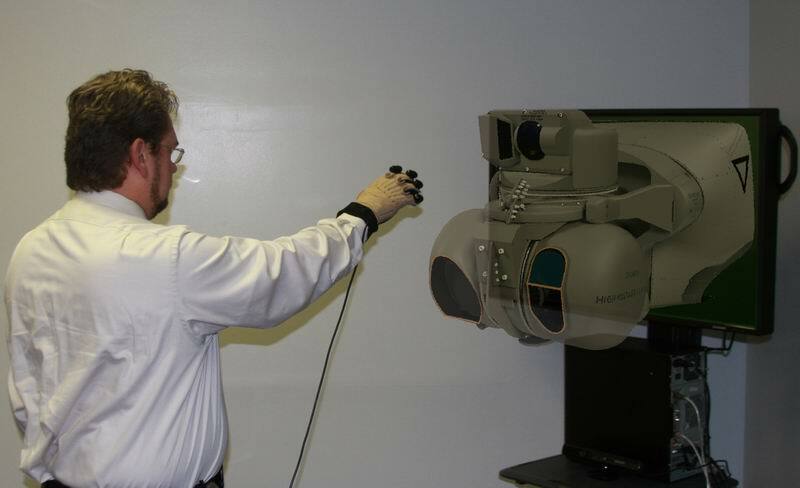 Huntsville company was asked to perform a “proof of principle” for 3-D Maintenance Training and Display System. 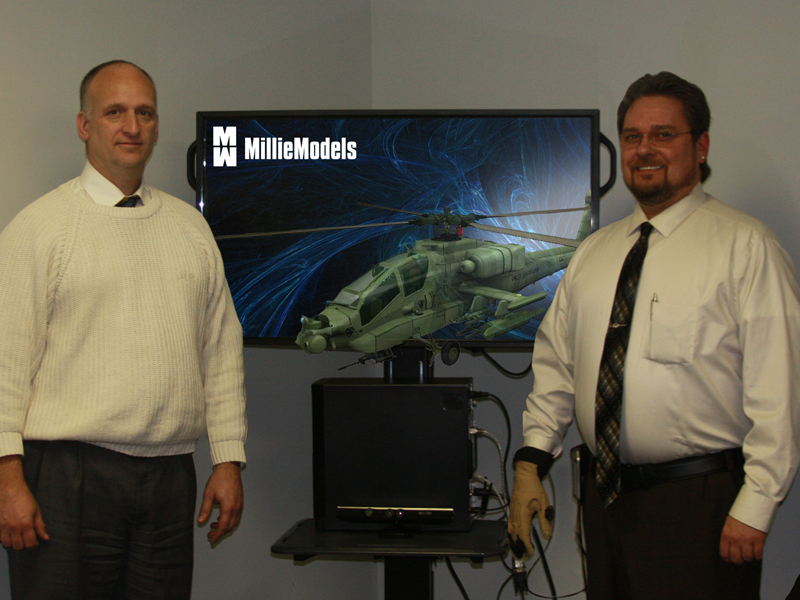 Huntsville, Alabama – : In a proof of principle demonstration of 3-D technology to the Apache Project Office, PEO Aviation, MillieModels, a local Service Disabled Veteran Owned Small Business in Huntsville, AL, successfully demonstrated the new potential of 3D technology using an Alioscopy Autostereoscopic monitor and Cyber Glove haptic glove. In an almost science fiction fashion, Donathan Hutchings, Chief Operations Officer and designer of the training simulation, used a cyber touch haptic glove with sensors, a no-glasses 3D Alioscopy 42”monitor, a Microsoft K inect system, and a custom built computer to show a proof of principle training simulation to members of the Army’s PEO Aviation Department at Redstone Arsenal. Attendees witnessed Mr. Hutchings manipulate a 3D M-TADS/PNVS with the cyber touch haptic glove. One of the guests expressed surprise that this presentation was a proof of principle and not a final product and asked how long it would take to field this project to the Army school houses. 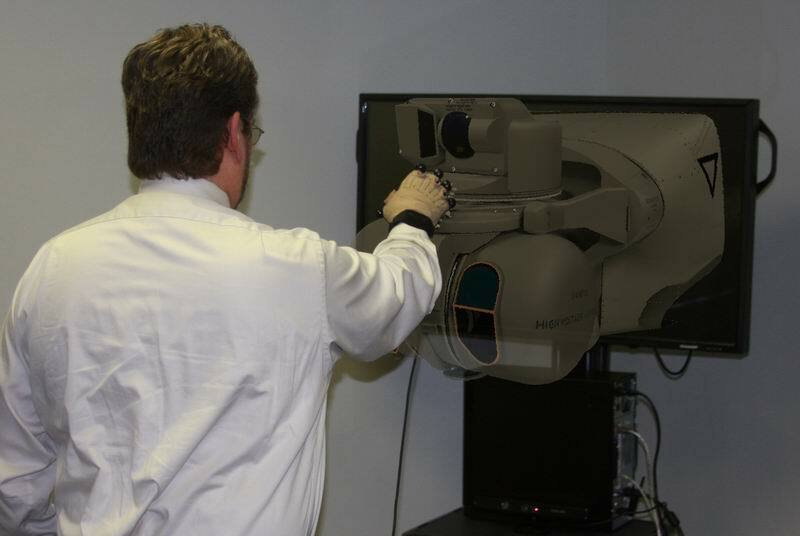 Huntsville has always been on the cutting edge of technology and 3D technology was furthered enhanced with the successful demonstration of a 3D no –glasses Alioscopy monitor, a Cyber Touch haptic glove, a Kinect system, a custom built computer and MillieModels, a small company that does the impossible. The Technology and Demo can be seen at MillieModels offices in Huntsville Al.